The land on which Yagan Square sits once formed part of an extensive wetland system that was an important meeting and food-gathering place for Aboriginal people. Since the early 1990s, the ambitions of Reconciliation have evolved from addressing the misunderstandings of Australian history and race relations to instigating policies and practices that encourage relationships and dialogue between Indigenous and non-Indigenous Australians. 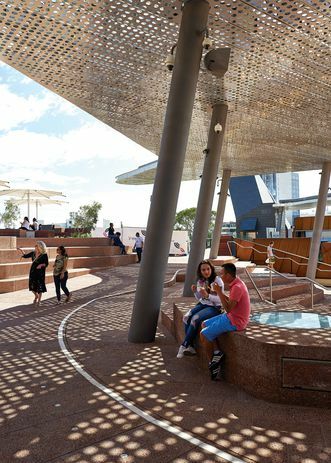 The opening of Perth’s Yagan Square in March 2018 completes a trifecta of post-millennium squares conceived within this shifting framing of Reconciliation; it was preceded by Melbourne’s Federation Square (2002) and the transformation of Adelaide’s Victoria Square/Tarntanyangga (Stage 1 – 2013). Collectively these spaces speak to shifting notions of national identity, Reconciliation and civic life. 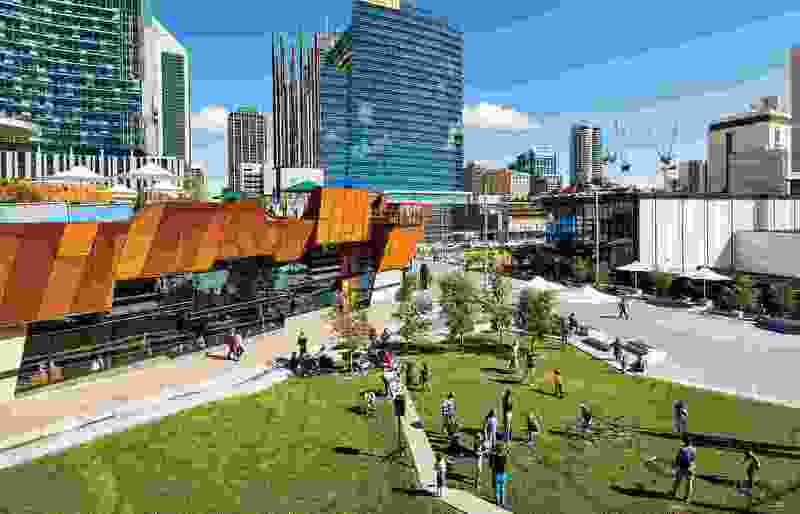 This latest addition forms a critical piece of Perth’s decade-long City Link redevelopment plan, which aims to address the separation of the city centre from Northbridge by sinking railway infrastructure and in-filling with commercial redevelopment, entertainment precincts and public open space. Designed by Aspect Studios with Lyons Architecture and Iredale Pedersen Hook, Yagan Square is envisaged as a new heart for the city. Significantly, this land once formed part of an extensive wetland system that was an important meeting and food-gathering space for Aboriginal people. 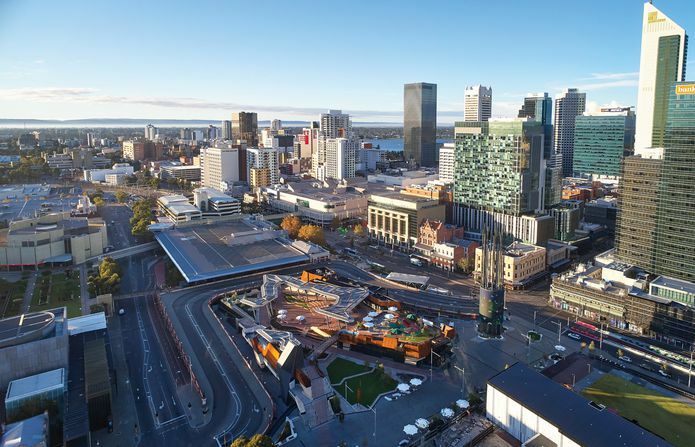 Yagan Square is part of a major City Link redevelopment plan that aims to connect the previously disconnected Perth CBD with Northbridge over the sunken railway line. The square’s name celebrates an influential Noongar warrior and leader who was murdered in the early days of the colony. Subsequently Yagan’s head was sent to England and exhibited in a museum before being buried in a cemetery in Liverpool in 1964. For decades, the Noongar community canvassed for a statue to memorialize Yagan and, after much political debate, a life-size bronze statue was constructed in 1984 on Heirisson Island in the Swan River. However, in 1997, within weeks of the repatriation of Yagan’s remains to Perth, vandals beheaded the statue with an angle grinder – twice. 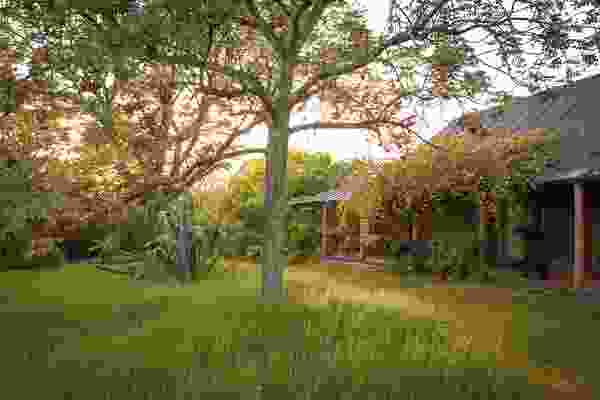 Given the history of this racially charged battle over significance, the decision to name the square in Yagan’s honour represents a hard-won acceptance of his value to the Noongar people, and, even more importantly, an acknowledgement of his place in understanding Perth’s foundational history. At first glance, the design strategies underlying Yagan Square are familiar. Similar to Federation Square, an architecture of irregular forms sweeps over railway lines to frame a central gathering space. And like Victoria Square/Tarntanyangga, the unique landscape characteristics of the state, along with references to Indigenous place, are celebrated through iconic landscape plantings (in this case grass trees, specialist-grown non-typical eucalyptus species and seasonal wildflowers) and the use of specific geological materials. 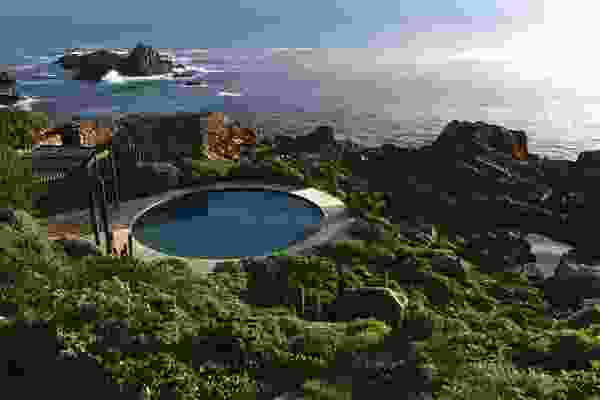 The square manifests as a complex constructed topography of open lawns and jagged architectural forms punctuated by lookouts, ramps and staircases. 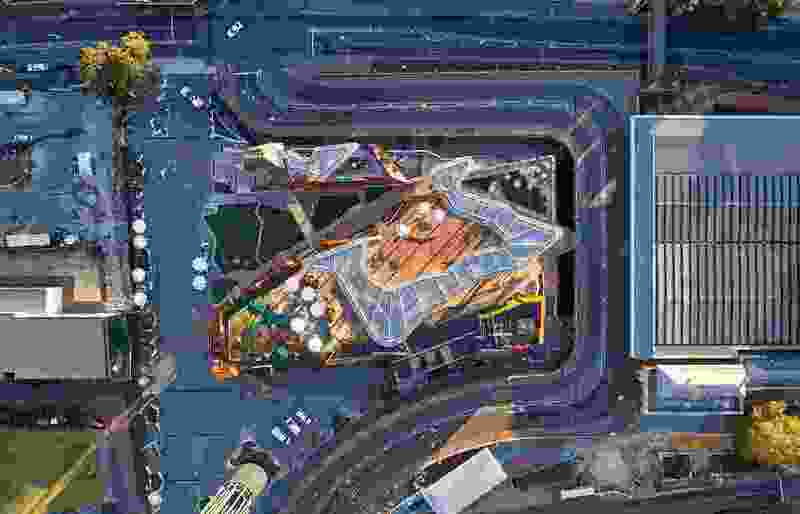 However, these ambitions are amplified in Yagan Square – reflective of the strengthening commitment to Reconciliation within the design community and government, advancements in digital technology, and the challenge of resolving the complex edges and level changes that characterize the site. 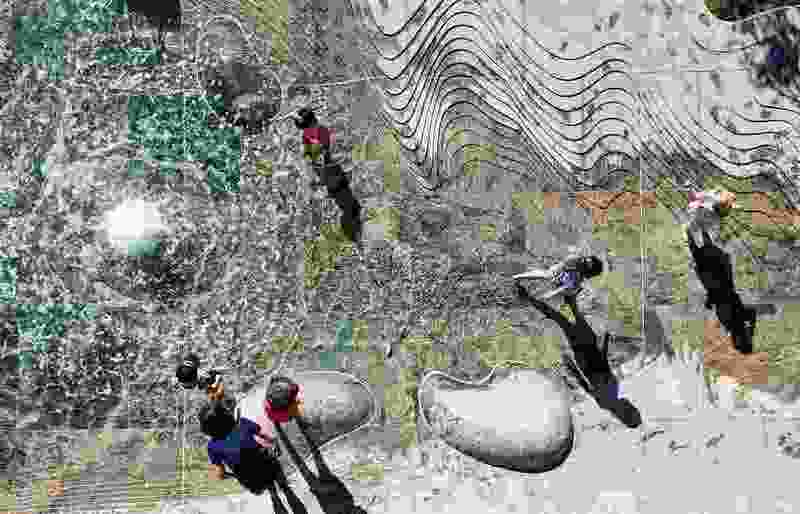 Together these factors shape a particular form of civic urbanism that asks more of the relationship between architecture and landscape, questions notions of collectiveness and informality, and opens up new strategies for acknowledging a past and continuing Indigenous presence. The complex resolution of level changes and movement patterns results in a constructed topography that stitches together various pedestrian “tracks” across the site, linking in one instance the Perth railway station concourse and lower platforms to the Perth bus station and extending the William Street spine. The resultant design is a jagged architectural form punctuated by peninsulas, lookouts, ramps and staircases that abuts the distinctive form of the historic Horseshoe Bridge. Materials suggest a traverse through geological strata, moving from verde austral (a green granite) on the lower levels through black granite and limestone and finishing with precast concrete panels and pavers of local laterite gravel at the amphitheatre. A playspace behind the amphitheatre continues the references to geology through a series of play mounds and rock structures. 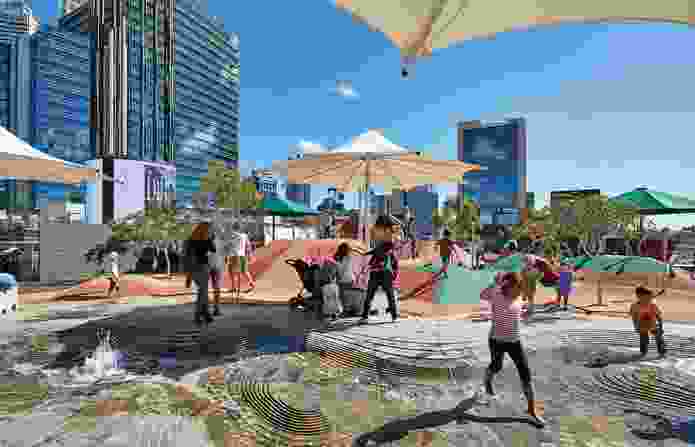 In time, a forest of Western Australian eucalypts planted at the highest point of the playground will offer a spectacular canopy (and much-needed shade). Lawn areas and clusters of plantings are interspersed throughout the terraces and ramps, along with a water feature titled Waterline referencing the wetland ecology of the site. Designed in collaboration with artist Jon Tarry, this 170-metre-long water feature is constructed from individually carved Western Australian granite stones. 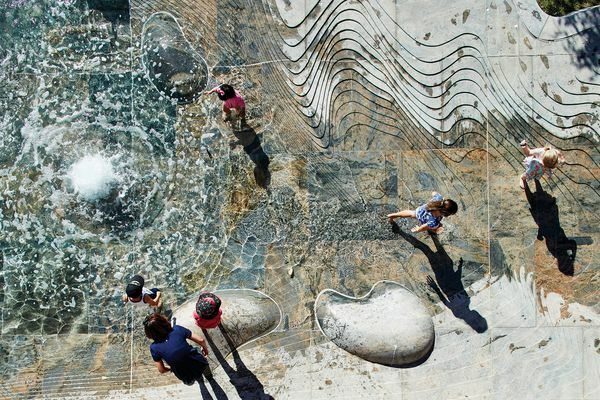 With its origins in the playspace, the feature transforms from urban steps and walls at the top of the site into free-flowing water channels before entering a shallow reflection pool at street level. 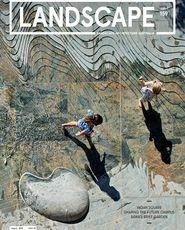 An elevated playground of mounds and rock structures, located behind the square’s central amphitheatre, references the local geology and incorporates plantings of Western Australian eucalypts. Capable of seating about a thousand people, the amphitheatre lies at the heart of the project. The scale is broken down through plantings, lawn and a monumental metal canopy that floats over large sections of the steps and ramp. From this elevated position, the space catches cooling breezes, while the high canopy (whose form references the past wetlands) modulates light throughout the day. Dual functioning, the canopy forms a critical part of the digital program, which comes to life at night. Designed to reflect digital content from above and below, the structure forms a spectacular canvas for colourful abstract lighting patterns and more refined digital images that reference the site’s environmental history and value as an Indigenous place. Working in combination with a forty-five-metre-high digital tower located at street level and crowned by fourteen metal bulrushes (which represent the fourteen Noongar language groups), the visual projections are experienced well beyond the square, forming a major digital “totem” for Perth’s CBD. The central amphitheatre space features a monumental floating metal canopy that provides much-needed shade in the daytime and a flexible canvas for colourful digital projections in the evenings. A creative template established in close consultation with the Whadjuk Working Party and South West Aboriginal Land and Sea Council offers a framework for respectfully and accurately integrating Indigenous stories, history and culture into the extensive digital and public art program. Features include the nine-metre-tall Wirin statue designed by Noongar artist Tjyllyungoo which greets visitors on the William Street frontage and Liquid Fire , an abstract image using balga plant resin laid into an architectural facade, designed by Noongar artist Sharyn Egan. The projection of image and sound (night and day) introduces the potential for a more complex and dynamic representation of Indigenous histories and stories (including a contemporary presence) to be included within the space, departing from the (over) reliance of static textual quotes dotted across many streets, squares and parks of Australian cities. Without question Yagan Square is at its best on a weekend night. This is also when the subtler design achievements become more obvious. With the major art galleries located just down the road, the square is devoid of any explicit cultural program such as museums, galleries or cultural centres. Instead food forms the dominant use – not high-end but accessible, with many stands in the market hall originating from local food trucks. On a warm night, the unusual permeability of the architecture encourages people to move freely from interior eating spaces into the amphitheatre to listen to music or just enjoy sitting outside. The elevated playground beyond the amphitheatre allows parents to supervise their kids but still be part of the action. Cut-outs in the walls, along with many smaller sitting areas, offer more intimate and quieter spaces, located away from bright digital lights and noise from the amphitheatre. This diversity of spaces, combined with reasonably priced food and the orientation of more alcohol-centric uses away from the central space, means that an unusually wide demographic – families with young kids, teenagers, young adults and older people – enjoyed the space during my Friday night visit. This interaction extended into the surrounding streets, with the digital tower projecting the live music performance from the interior amphitheatre into the wider city. The elevated height of the square’s heart enables it to catch cooling breezes; in the evenings, light projections on the metal canopy can be viewed from some distance. 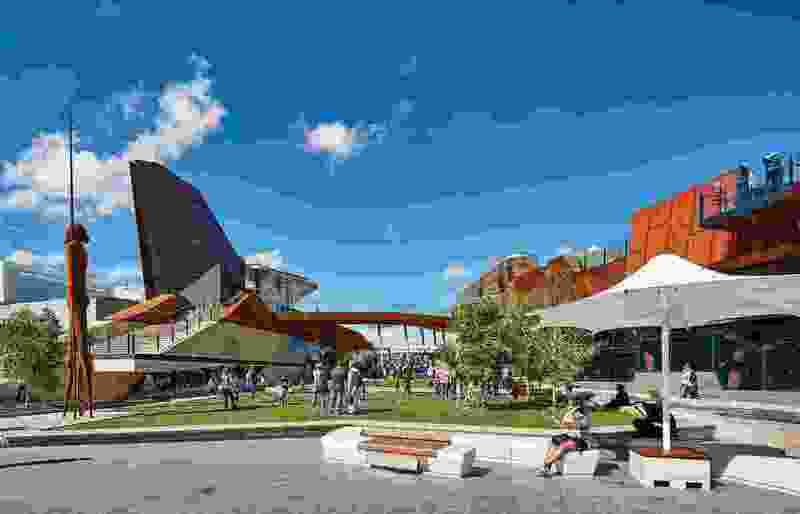 Only time will tell whether Yagan Square will foster the exchange, dialogue and respect underpinning the ambitions of Reconciliation. Ongoing debates over the construction of the flagship Apple Store in Melbourne’s Federation Square highlight the influence of management structures in shaping the success of civic spaces. While Federation Square offers the visual and spatial appearance of a civic gathering space, its corporate management model (which includes extensive control over cultural festivals and demonstrations) compromises its inclusiveness and relationship to the wider community. 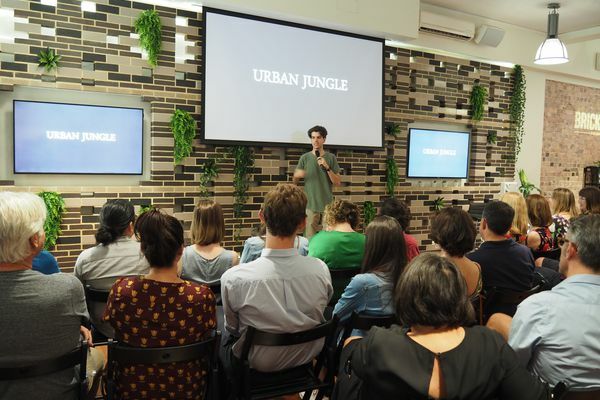 The civic future of Yagan, including its Reconciliation goals, will be significantly influenced by the programming and ongoing management of its spaces and events. Yagan Square is no architectural icon in the traditional sense. However, its level of architectural permeability, digital presence and spatial diversity make it decisively inhabitable. 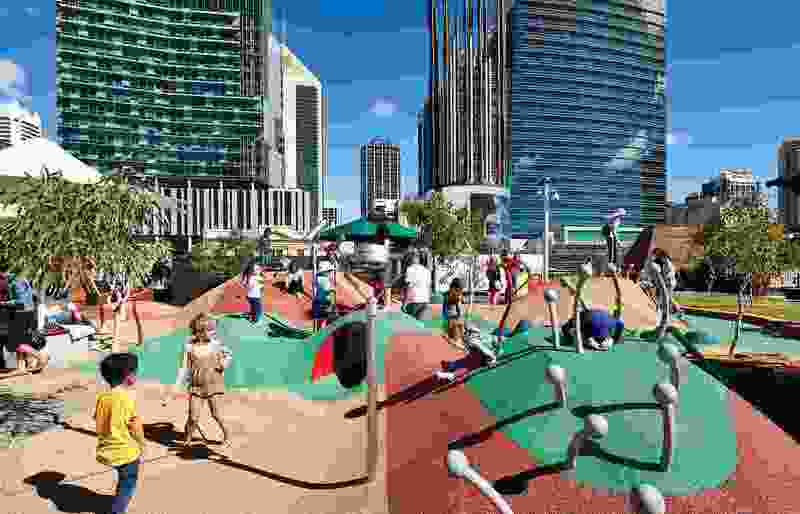 As one visitor to the space reflected on TripAdvisor, “The concept is quite clear here – provide ample space at the centre of the city where people can simply sit, stand or lie down and spend time doing nothing.” Yagan Square is shaped by a functional inclusiveness – food, play, movement and gathering. That said, the space has the capacity to shape-shift from a pleasant outdoor space suitable for a coffee or quick lunch into a major celebratory experience. 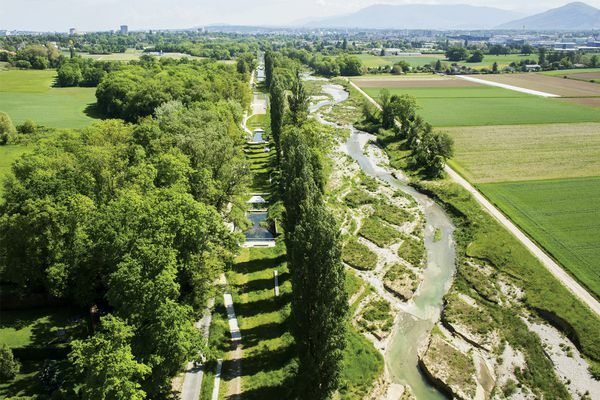 Returning to its origins as a gathering site on the wetlands, it is perhaps this social ephemerality that offers the best reference to the lost wetlands buried under the site – an everyday gathering space with the potential for the extraordinary. The square links the Perth railway station concourse and lower platforms to the Perth bus station; the permeability of the architecture and spaces encourages visitors to move freely around the site.